You may be wondering how intuition is related to language learning. One way to realise the significance of intuition is to consider why we as infants learned our mother tongue so seemingly easily (compared to most adults experience of learning a second language). One key reason is that infants ability to see meaning (unencumbered by opinions, attitudes, emotions, fears, etc) becomes highly developed early on. Children, in the process of “growing up” exhibit a certain naivety, which we may consider as cute. In reality, it is just the ability to see things as they really are. Intuition is part and parcel of their emerging ability to see meaning. Rene Descartes said “The two operations of our understanding, intuition and deduction, on which alone we have said we must rely in the acquisition of knowledge.” One may wish to question if there are only 2, however what is very clear is that the recognition of intuition as a powerful tool for learning has been neglected for the most part in our attempts to better understand the process of learning. If you speak to language learners who have got to the highest levels, most would agree that learning to trust yourself and your own instincts is a key in the process of learning. Relying mainly on teachers, books, course materials in language learning is a recipe for slow progress, destined to get you stuck at some point. This reliance can deaden your ability to trust yourself, to look to yourself for meaning, to guidance as to what to do next. The sooner a language learner recognises that we have such abilities that need to be exercised and developed, the more chance there is of achieving success. Language materials and courses that don’t help you to develop this ability will actually take you in the wrong direction…towards believing that language can be mastered by study, memorisation, drilling etc. There is no such thing as neutral materials. Materials, instruction or learning that predominantly require the use of your intellect at the expense of this sense is a key factor that holds language learners back. As Malcolm Gladwell wrote “Insight is not a lightbulb that goes off inside our heads. It is a flickering candle that can easily be snuffed out.” Blink: The Power of Thinking Without Thinking. There are many reasons why immersion and real life use of language is valuable. One reason is that it encourages you to develop your senses, and intuition is one of them. Of course there is more needed than intuition, but it can take you to places where your intellect and reason by themselves could not. Every successful person in every field whether it be the arts, the sciences, business, psychology, the sports will talk about the value of intuition. 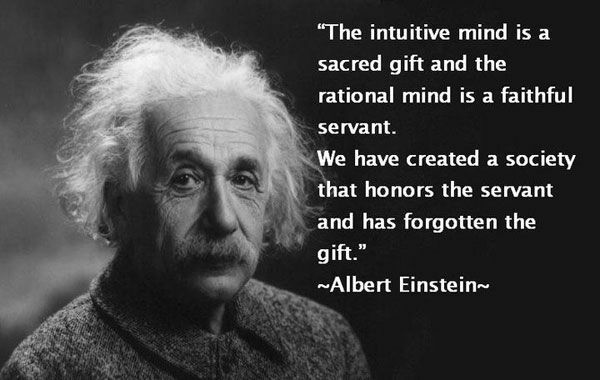 Albert Einstein, Bill Gates, Ingrid Bergman, Pablo Picasso, Rumi, Alan Alda, Rabindranath Tagore, Carl Jung, Richard Branson, Richard Feynman, Michael Jordan to name a few all talked about intuition being a key to the way they got to where they did in their respective fields. So what is intuition and how can we develop it? ” The ability to understand something immediately, without the need for conscious reasoning.” is one definition I found. Once we learn to trust our intuition, it enables us to see and understand relationships that otherwise would take a long time to work out. Once we learn to trust this sense, it can tell us whether we are going the right way and whether what we are doing makes sense to us. Sylvia Clare’s view that “Intuition is the highest form of intelligence, transcending all individual abilities and skills” may be disputed by some, but I suspect mainly by those who have not got to the heights in their own fields. Developing intuition requires us to learn to become more perceptive and to listen better to others as well as ourselves. Anyone can learn to develop their intuition as long as they are willing to do what it takes to do it. It is not as straightforward as learning vocabulary, but the spinoffs can be considerable. Quietening the mind can be a useful start for some people. One reason for this can be best described by the following observation. If you drop a stone into swiftly moving or turbulent water you will not see the effect it had. But if you drop it into still water, you will clearly see the impact it had on the water. There is of course a lot more to this subject that I haven’t touched on, but I hope this post has opened up some doors for you to explore.